Transit GO Ticket is a mobile app that lets you quickly buy bus, rail and water taxi tickets on your phone and get where you need to go without having to pay cash. You can buy as many tickets as you’d like. Tickets are the same price as if you were paying with cash. Like cash, you can use your Transit GO Ticket to transfer to and from any Metro bus for up to 2 hours from the time you activate the ticket. Also like cash, transfers to and within other systems are not allowed. When you’re ready to board, simply activate the ticket and board transit. On the bus, you’ll show your mobile device screen to the driver. On the Water Taxi you’ll show it on the fare officer before boarding. On the streetcar, light rail and Sounder (and Metro RapidRide if you board through the rear doors) you’ll show it to a fare enforcement officer. You can download the app for Android, iPhone and Windows mobile devices and buy tickets directly using your credit or debit card. You can also buy tickets through Metro’s "Marketplace" site on your PC or desktop and have the tickets appear in the app on your mobile device. What transit agencies can I access using a Transit GO Ticket? 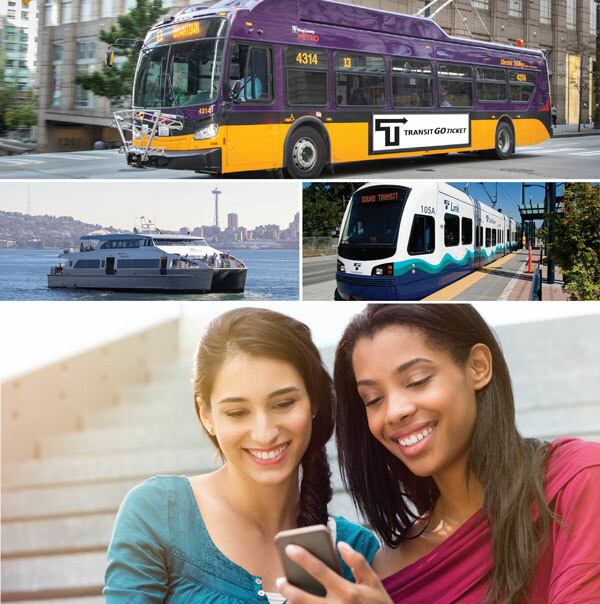 Metro Transit buses and Metro Community Vans, King County Water Taxi, Sound Transit Link and Sounder and Seattle Streetcar accept the Transit GO Ticket. Sound Transit Express buses and King County VanPool, VanShare and ACCESS services are not included in this pilot project. How is the Transit GO Ticket different than an ORCA card? Transit GO Ticket focuses on helping infrequent transit users reduce the usage of cash on buses by providing a simple easy mobile alternative. Current ORCA cards aren’t mobile based. Are the prices for Transit GO Tickets the same as with paying with cash? The tickets have exactly the same price like paying with cash. Do I need Wi-Fi or cellular data to buy or activate a Transit GO Ticket? Internet access is required to complete a purchase, but not to activate the ticket, if one decides to save the tickets on the phone. A rider can select to save their tickets to their phone or to the cloud under the ticket storage menu. Tickets stored on the cloud require Wi-Fi or cellular data to access and activate. Please plan your trip with enough time to complete your transaction prior to boarding. Can I transfer with a Transit GO Ticket like I do with e-purse on an ORCA card? Mobile tickets behave exactly like paper tickets, and allow transferring between Metro buses only. To take advantage of other electronic transfers and other features, one should use ORCA. In addition to credit and debit cards, are there any other payment forms accepted for purchasing Transit GO Tickets? Currently only credit and debit cards are accepted as means of payment. Transit vouchers, Apple Pay and PayPal are not accepted at this time. Will Metro and other agencies that are using Transit GO Tickets still accept cash to ride? Yes, cash will continue to be accepted on Metro buses, and via ticket vending machines for other transit services. Can I buy an ORCA LIFT reduced fare ticket with the Transit GO Ticket app? No. ORCA LIFT products can only be purchased by using an ORCA card. How much time might riders save using Transit GO Tickets? Riders who would otherwise feed cash into the farebox or buy a transit ticket at a vending machine could save several minutes by instead purchasing and displaying their Transit GO Ticket on their smartphone. Will Transit GO Tickets save money and how? The application will give riders a new, convenient way to pay to ride transit. With fewer riders paying by cash, it reduces some wear and tear on fareboxes. Showing a Transit GO Ticket also can speed up boarding, and also speeds up the trip for everyone, potentially saving operating costs for transit agencies. What other agencies or cities are using mobile ticketing, and which cities are using this same vendor? There are over 20 agencies in the country using mobile ticketing, including Austin, Texas, New York Waterway, Atlanta and Toronto. The vendor selected for this implementation has already implemented mobile ticketing with seven other agencies. Can my driver help me if the Transit GO Ticket app isn’t working? A driver might only be able to spend a quick moment answering a question, but cannot help navigate the app at the risk of delaying transit service. Metro’s Customer Service staff at 206-553-3000 can help either in person or by phone prior to taking a trip. Who can I contact if I have any problems with the Transit GO Ticket App? Metro’s Customer Service group can assist with most questions regarding functionality, navigation, ticket validation and payment issues. Please call 206-553-3000.